Save 10.0% on select products from Cakebe with promo code 10GFPWND, through 2/28 while supplies last. 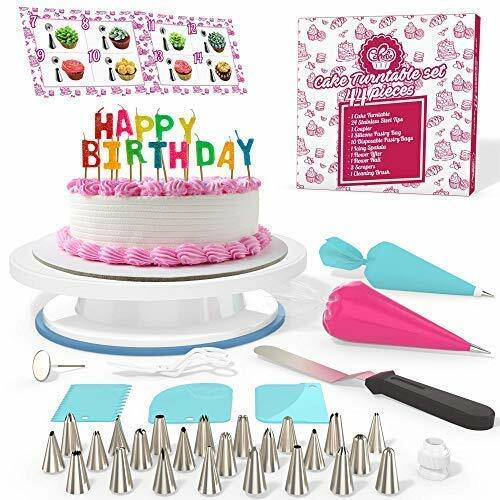 ✅ 44-PIECE CAKE DECORATING SUPPLIES: This baking kit has every decorating tool for cake decorating all in one set, including: a cake turntable, 24 cake decorating tips, 10 disposable pastry bags, 1 silicone piping bag, 1 coupler, 3 cake scrappers, 1 icing spatula, 1 flower nail, 1 pair of lifter scissors, cleaning brush and decorating guide. ✅ NO EXPERIENCE REQUIRED: Anyone can create professional-looking cakes with these high-quality baking tools! This cake decorating kit will help you create beautiful cakes at home for any occasion. ✅ EASY, SAFE FOR KIDS & ADULTS: Cakebe cake piping set is made from safe materials, quality stainless steel and durable plastic for fun & easy cake decorating. ✅ FREE GIFT BOX, GUIDE & EBOOK: It's so much more than a turntable baking kit. The Cakebe baking tools and cake piping set comes with a gift box for easy gifting and storage , an illustrated cake decorating guide, and a helpful Ebook with tips, tricks and inspiration! ✅ 100% RISK-FREE, MONEY BACK GUARANTEE. If you don't love your cake turntable and cake decorating supplies, return for a full refund!